Marigold, comfrey, chamomile, arnica and Sea buckthorn are important curative herbs used in the traditional folk medicine for centuries. The marigold blossom (Calendula officinalis) is used for the preparation of potions, infusions and extracts. As for comfrey (Symphytum officinale) it is its root that is mainly utilized, but also its leaves can be picked and used. One of the effective elements of comfrey is allantoin that is used in curative and cosmetic preparations. As for chamomile (Chamomila recutita) it is its dried floral garb without any addition of stems and leaves that is utilized. As for arnica (Arnica montana) it is its blossom essential oils that are mainly used. As for Sea buckthorn seed (Hippophea rhamnoides) it is its cold-press seed oil that is utilized. As for plantain (Plantago lanceolata) it is leaf that utilized mainly for its beneficial effects. Traditional product contains standardized oil and spirituous extracts of marigold blossom (Calendula offi cinalis) produced by a careful method which guarantees a high content of active agents. Owing to this the ointment contains a complete spectrum of agents of marigold, which guarantees its high and comprehensive efficiency. 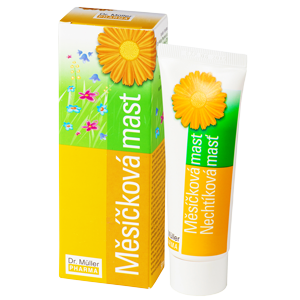 Marigold ointment Dr. Müller Pharma is convenient for massage, care for the skin infl uenced negatively by the environment (sun, wind, frost), or for dry skin of legs, hands and lips. Traditional product contains standardized spirituous extract of comfrey (Symphytum officinale) made by careful method which guarantees a high content and complete spectrum of effective agents. The agents contained in comfrey have complete positive effects on the skin. 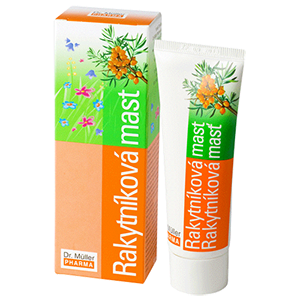 Comfrey ointment Dr. Müller Pharma is convenient for massage of tired muscles and for general care for the skin. Massages by the product contribute benefi - cially to the body regeneration. 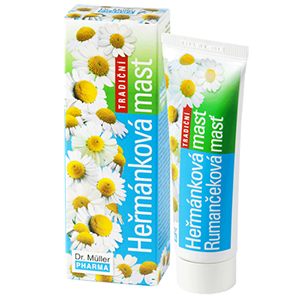 Chamomile ointment Dr. Müller Pharma is a traditional product containing chamomile oil made by means of a careful distillation of the blossom of wild chamomile (Matricaria recutita). It has standardized content of active substances, alpha-bisabolol and chamazulene. The substances contained in the chamomile oil affect quite benefi cially the skin irritated in any way (e.g. by sun, frost, wind, or radiation). Owing to high content of glycerine and owing to the special formulation and content of macadamia oil and beeswax the ointment greases the skin perfectly. Apply several times a day as needed. 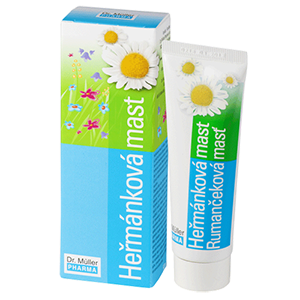 Arnica ointment Dr. Müller Pharma is a traditional product containing standardized oil extract of arnica blossom (Arnica montana) made carefully to guarantee high content of active substances. Arnica substances, especially essential oils, have beneficial effect in a number of problems related to muscle overload and stran. 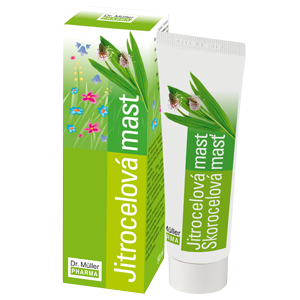 The arnica ointment is suitable for massage and subsequent skin care after injuries, and in case of problems with the locomotor systems and extremities. It relieves the muscle stress and refreshes tired legs. Owing to the high content of glycerine and beeswax, the product lubricates the skin very well. Apply several times daily as needed. Sea buckthorn Ointment by Dr. Müller Pharma is a traditional product containing 100 per cent of Sea buckthorn virgin oil obtained by cold-press. Sea buckthorn contains a number of biologically active substances that affect beneficially the irritated skin (e.g. by sun, frost, wind, radiation). In regard of the high content of glycerine and sea buckthorn oil, the ointment greases the skin very well. Apply several times a day as needed. To increase the effect, let the ointment act overnight. The chamomile oitnment Dr. Müller Pharma is a traditional product containing chamomile oil made by means of a careful distillation of the blossom of wild chamomile (Chamomilla recutita). It has standardized content of active substances, alpha-bisabolol and chamazulene. The substances contained in the chamomile oil affect quite beneficially the skin irritated in any way (e.g. by sun, frost, wind, or radiation). 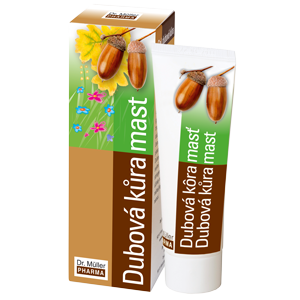 Owing to its greasy ointment base and high content of the chamomile extract the product lubricates the skin thoroughly and leaves greasy film on the skin. Plantain ointment containing ribwort plantain leaf extract is a traditional product suitable for skin care. The plantain-contained substances calm beneficially the skin irritated by e.g. insect bite or sunbathing. 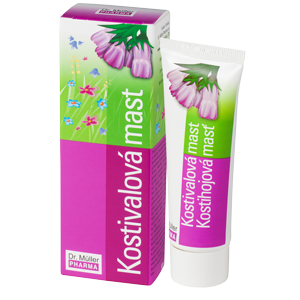 The ointment is also suitable for massages of tired legs and hands. Thanks to high glycerine and beeswax content, it greases the skin well. Traditional product containing standard oak bark (Quercus robur) extract made by a careful procedure ensuring high content of active substances. Well-proven ointment base contributes to the skin softening and greasing at the application site.